Damien Comer - preparing for Mayo. The month of April finally saw Damien Comer take some time to draw breath after a hectic three months on the field with county and college. Having captained Galway to the league final, the Annaghdown man was a central figure in NUIG's march to the Sigerson Cup final. It meant last month he was able to get some downtime and play a couple of league games with his club before what potentially could be a hectic summer. Sunday week sees Galway travel north to take on Mayo in what is one of the most anticipated games of the year since the championship draw was made, and the 24-year-old is balancing his preparation with completing his thesis to become a science and maths teacher in NUIG. The league saw the two teams head in opposite trajectories. Galway marched all the way to the final and Mayo only hung on to their division one status thanks to a Hail Mary effort deep into injury time. Comer, however, knows Sunday week's game is a different animal. "A lot of people might be saying Mayo are on a downward slope and Galway are on an upward one, but I do not think you can read too much into it," he says. " The league is the league, they are two very different competitions. The intensity level is going to be well up, and in the championship over the past two years there has been nothing in it." 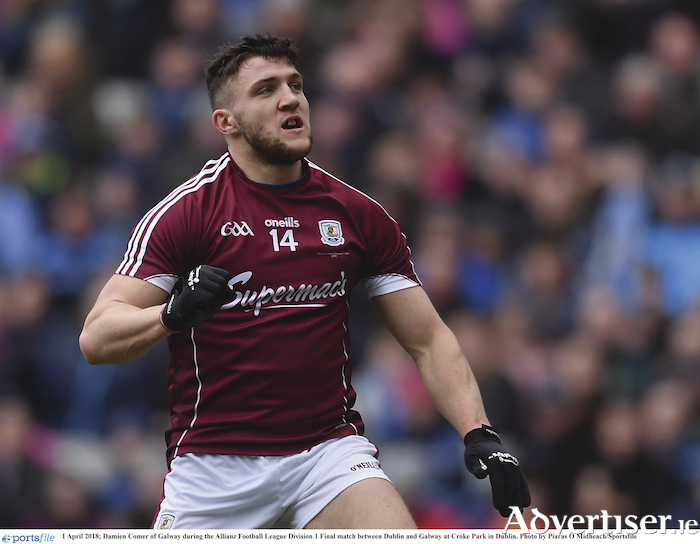 Having taken Mayo's scalp in the last two Connacht championships, Galway know they have the beating of their northern neighbours, but Comer is also conscious Mayo come into this one hurting. "Whatever their form in the league, Mayo are a wounded tiger, and they are coming back with a bit of hurt from the last two years and will be coming back at it heavy. "It is also no mean feat that they have been in the All Ireland final the last two years and probably should have won them - bar a kick of the ball and a bit of luck at the end of the day. It's going to be a big one, it is a bit weird that there is such a big game so early on in the summer, but everyone is looking forward to it." The last couple of years has seen a re-emergence of Galway as serious football side, and with that, support has grown. "It's nice to see. Growing up as a young lad I was always going to Galway games and there always was a real buzz around Galway football and I think it's getting back to that now. When you see the hurlers after winning last year, the city was buzzing. You'd look up to that and think it's time for us to get a move on and hope to reenact some of that - be it this year or next year - but hopefully one of the years." Having that support and playing in front of big crowds is something Comer relishes. "I think it is every child's dream when you are growing up. When you put on the maroon jersey, you want to play in front of as big a crowd as possible. "I think it was only last year or the year before, we played Fermanagh in Tuam and there was only about 800 people at it and most of them from Fermanagh, and it is pretty depressing, I'm not going to lie, when you are getting out-roared by the opposing support. The support this year has been massive, and when you have that kind of support, it is like having an extra person on the pitch."